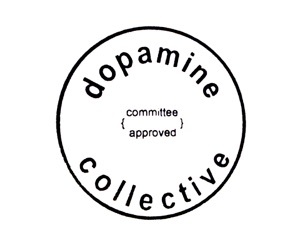 the dopamine collective™ is an eclectic collection of scientific minds with a common strong desire to shed their lab-coats and embrace the philosophy of the art world. Each uses their trained scientific field to create their unique body of work. The project was created to examine the construction of art using the scientific method, while exploring society’s need for conclusive authorship. As a plausible group, the ‘collective’ explores fiction as reality drawing on an extensive scientific background.